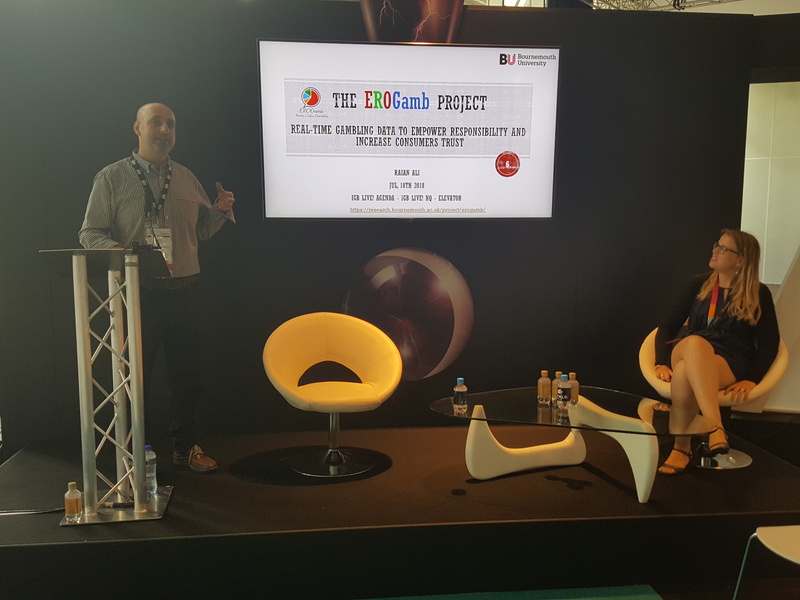 The EROGamb project funded jointly by GambleAware and Bournemouth University was invited to iGB Live! HQ (17th – 20th July 2018) at the Amsterdam RAI. The presentation focused on the future designs of online gambling sites to improve the conscious and responsible nature of the gambling experience. This is mainly achieved by engineering such sites to capture a wide range of gambling behavioural data and make them available in real-time to gamblers and their surrogate software and mentors. The invited talk, delivered by the project lead Dr Raian Ali, also presented recent results in relation to the types of data to be made available by gambling sites and their importance and, also, the gamblers views and opinions of the EROGamb solutions. For more information, read the iGaming Times article introducing the talk and the Conversation article about the EROGamb vision.